We can now reveal our exciting programme of concerts for the 2017-18 season, as described in the brochure included with this newsletter and on the Havant Orchestras website. As usual, it includes three main concerts by each orchestra, with Havant Chamber Orchestra at Ferneham Hall, Fareham, and Havant Symphony Orchestra at Oaklands Catholic School, Waterlooville. Ticket prices remain unchanged again for this season, with separate season tickets available for the three main concerts at each venue and an additional discount when buying both season tickets to cover all six concerts. Please book season tickets using the form included with the brochure, which can be handed in at a concert or posted to the Tickets Secretary. Additional copies of the form are available at concerts, where you can also pick up more printed copies of the brochure for yourself and your friends. A PDF copy of the form, suitable for printing on A4 paper, can be downloaded from next season’s “Tickets” page on the website. Season tickets booked before the 8th July HSO concert at Oaklands can be collected at that concert, otherwise please enclose an SAE so that the Tickets Secretary can post them to you. Tickets for individual concerts normally become available about two months before each concert, but for the first concert in October booking does not usually open until around mid-September in order to allow preferred seats to be allocated for season tickets. (Season tickets will still be available after that date, but the seating choice may be more limited). 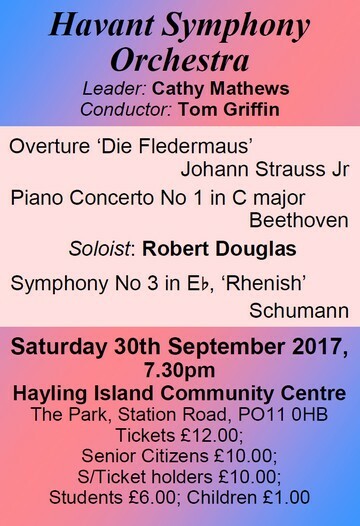 In addition to the six main concerts described in the brochure, HSO has its usual “Popular Classics” pre-season concert at Hayling Island Community Centre on Saturday 30th September, selected and conducted by our current Bob Harding Bursary award holder, Tom Griffin. This year’s programme is described on the back page and includes more Beethoven in the form of his first Piano Concerto. Details about how to obtain tickets will be made available shortly before the July concert. Meanwhile, we are looking forward to a delightful all-Beethoven concert on Saturday featuring local pianist Roger Owens as well as the famous Symphony No 5. There are not many opportunities to see live orchestral classical music in this area, so please make the most of it and bring along lots of friends to share the experience! 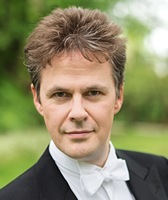 Our soloist Roger Owens will be talking about Beethoven and the piano concerto. 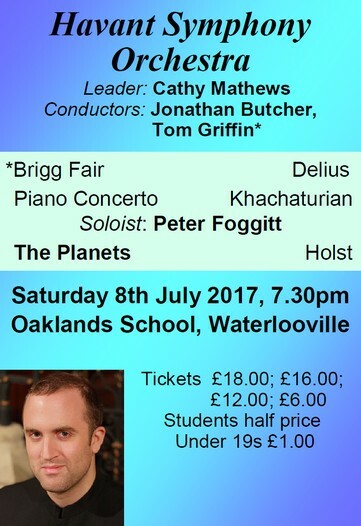 The pre-concert interlude in the Octagon Lounge will be given by the choir of West Hill Park School with their Director of Music Mrs Blunn. The opportunity to perform to an audience is a special occasion for these talented children, so please move into the Octagon lounge in good time and encourage others to join you. Feel free to move around quietly, but to allow everyone to enjoy the music please keep any conversation low or move well away into the bar area or foyer. This month brings the final concert in a tremendous and varied HCO season. I’m delighted to work with pianist Roger Owens and to welcome him to Ferneham Hall for the Beethoven 3rd concerto on May 20th. I’ve known Roger for a number of years through his passionate and dedicated work at Winchester’s Peter Symonds College, including on the Hampshire Specialist Music Course, inspiring many of the musicians of tomorrow. Indeed, quite a few former students number amongst the ranks of HCO currently. 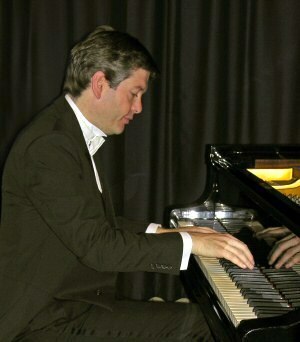 Roger is a superb pianist and accompanist, yet I’ve not shared the stage with him until now. The chance has somehow eluded me until this opportunity arose, thanks in part to the generous sponsorship of the Meon Valley Friends led by Crawford Wright. For our all-Beethoven series finale, none of the works need a great deal of introduction, of course. I’m often asked why musicians perform the same famed masterpieces over and over, and neglect other works. I think there are a number of answers to this. As a chamber orchestra, Beethoven – and his symphonies in particular – form our bedrock. As musicians we need constantly to revisit this incredible legacy of works, not least because there is nothing more important written for an ensemble of our size and scale. In addition, I think Beethoven speaks with a depth of humanity to all, which is as relevant now as ever. And, from my point of view as an interpreter, every time I revisit the works we’ll perform – even the Prometheus Overture – there’s a tangible feeling of awe and reverence. It is never, ever routine. It can’t be. These works are justly famed for many reasons, and no matter how well-known, they remain towering masterpieces, singing with a fresh voice on every hearing. Beyond all this, with HCO we try to combine the well-known with the many hidden gems in the repertoire. Recent seasons have seen successful outings of music by William Matthias, and Leo Weiner – many will remember his Serenade for Small Orchestra in our performance last season. Those lucky enough to have caught our string orchestra concert in Emsworth in March will testify to the stunning beauty of Puccini’s little-known ‘Crisantemi’. And, during the season to come, we include the Richard Strauss Duet Concertino for Clarinet, Bassoon and strings, coming up in our autumn concert, featuring soloists from the orchestra Rob Blanken and Richard Moore. Other highlights of the coming season include the Schumann Piano Concerto with Richard Uttley, a regular YCAT artist, and with whom I’ve collaborated many times; an elegantly balanced Mozart and Czech programme with violin Rose Hsien in not one but two concertante works; and – yes! – more Beethoven, this time the Eroica, with perhaps the single greatest opening movement of any symphony, ever written, ever. Now, there’s a bold statement on which to finish! I do hope you enjoy our season finale, and will be able to join us for more throughout 2017-18. If you enjoy attending live classical music concerts, there isn’t an enormous choice in the Havant and Fareham area, especially as there are few suitable venues, but there may well be more than you think. See the Events page on our website www.havantorchestras.org.uk for listings which include not only Havant Orchestras concerts but also many other amateur and semi-professional orchestral concerts and chamber music events in the region. The area covered includes Havant and Fareham and adjoining areas such as Portsmouth, Southampton, Winchester, Petersfield and Emsworth, and even further in some cases (including Basingstoke, Chichester and the Isle of Wight). See also the ‘Music in Portsmouth’ website musicinportsmouth.co.uk for listings of amateur instrumental and choral concerts in the Portsmouth area.